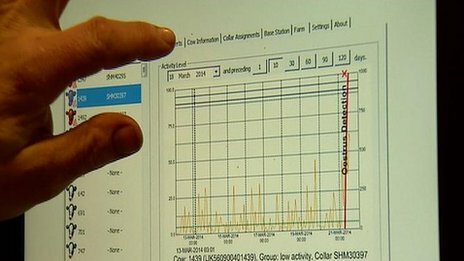 A new project allows the farmers to track the health of their herd and identify potential health problems early. Silent Herdsman, which developed the scheme, has been awarded millions of pounds to help develop the project. The Scots-based firm now plans to roll it out to dairy farms across the globe. The system operates by placing special electronic collars on to the cattle. The collars contain a wireless sensor which transmits data about the animal's health and the amount of milk they are producing back to a central computer or device. The data allows farmers to ensure their herd is as healthy as possible in order to maximise the amount of milk being produced. It also helps identify any sick animals as early as possible. Silent Herdsman chief executive Annette McDougall said: "Farmers can monitor the fertility behaviour of the animal, the likelihood of pregnancy in the cow and ultimately produce more milk to boost operational efficiency on the farm." The firm has secured a multi-million pound investment led by Scottish Equity Partners to expand and develop the project. Ms McDougall said that her firm were actively looking to further develop the system to a "wider ecosystem" which would include vets, suppliers and retailers who would all be able to receive an animal's data being updated in real time. She said: "Having the internet of cows being central to our strategy, we are excited about how we manage, analyse and distribute this data across a wider ecosystem"
"It's very important to be able to have up to date information on animals on a regular basis but to have it real time, we believe, gives us an edge." Graham Kerr, a dairy farmer from Lanarkshire, said the scheme had saved him both time and money. He said: "It is very useful, it is saving us a lot of time on the day to day running of the farm, it has given us more time to spend with our families. "But it has also given us the time to do other jobs on the farm which helps us do a better job of being a dairy farmer." He added: "If we can catch a cow when she's going lame early on, or sick through a digestive problem, we can intervene earlier and hopefully save ourselves an expensive vet call out."